A bell jar is a glass jar, similar in shape to a bell, and can be manufactured from a variety of materials (ranging from glass to different types of metals). Bell jars are often used in laboratories to form and contain a vacuum; they may also serve as display cases or transparent dust covers. It is a common science apparatus used in experiments. A vacuum bell jar is placed on a base which is vented to a hose fitting, that can be connected via a hose to a vacuum pump. A vacuum is formed by pumping the air out of the bell jar. To demonstrate that sound needs a material medium for its propagation. Sound is a mechanical wave that needs a material medium like air, water, steel, etc., for its propagation. We can describe a sound wave by its frequency, wavelength and velocity. The sound wave is a longitudinal wave, ie., the particles of the medium vibrate in a direction parallel to the direction of the propagation of the wave. A sound wave travels in the form of a longitudinal wave and it requires a material medium for its propagation. Sound always originates from some vibrating body. These vibrations are produced by tuning forks, drums, bells, the strings of a guitar, etc. Human voice originates from the vibrations of the vocal chords and the sound from the musical instruments is due to the vibrations of the air columns. In some cases, the vibrating frequency of the source may be so very small or so very large that it is not audible to the human ear. The audible frequency ranges from 20 Hz to 20 kHz. The frequency below 20 Hz is called infrasonic and the frequency above 20 kHz is called ultrasonic. The bell jar experiment is a common experiment used to demonstrate that sound needs a medium to travel. What is a bell jar? 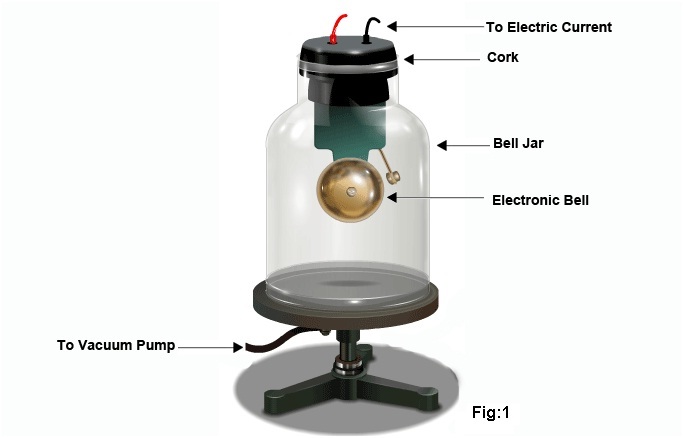 A bell jar is a laboratory equipment used for creating a vacuum. It is so named as its shape is similar to that of a bell. A bell jar is placed on a base which is vented to a hose fitting that can be connected via a hose to a vacuum pump. By pumping the air out of the bell jar, the air pressure inside the jar can be varied. 1. Arrange the apparatus as shown in the figure. 2. Connect the electric bell and the vacuum pump to the air tight glass bell jar. 3. Insert key to complete the circuit. 4. Reduce the air pressure inside the chamber by pumping out the air through the vacuum pump. 5. As the air in the jar is being pumped out, the sound becomes fainter, although it is the same current that is passing through the bell. We have observed that as the pressure inside the bell jar decreases, the intensity of sound heard from the jar gradually decreases and stops. However, the bell is still continuing to ring.